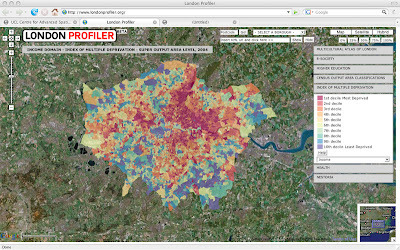 London Profiler is a web site that enables users to build up a picture of the geo-demographics of Greater London from data on population attributes such as cultural/ethnicity, deprivation, the extent of e-literacy, level of higher education, and health related problems together with the synthetic free geodemographic classifications available in the UK. The site allows users to visualise themes at different scales, to search by postcode or zoom at borough level, to change the layer’s transparency and to add KML layers. Developed by our lab (CASA) we are slightly biased here but we think its a great use of Google Maps combined with more traditional GIS data that would not normally be available online in such an easy to use interface. Maurizio’ flat is comfy and I got a lot of friends there! Good to hear from you Bob – its been a long time..
Nice site. But most of the data you show is available for all of England. Why limit yourself to the capital? Good question Rob – the focus for London Profiler was ‘London’ due to our work with local authorities. We are developing a similar tool for the Joseph Rowntree Foundation for the UK and NI. Did you have any problems with ward/OA boundary copyright?